• While cupcakes are cooling, prepare the frosting. You can add in food coloring of your choice for an extra effect. • Using a small spatula, frost the top of the cupcake with the frosting. 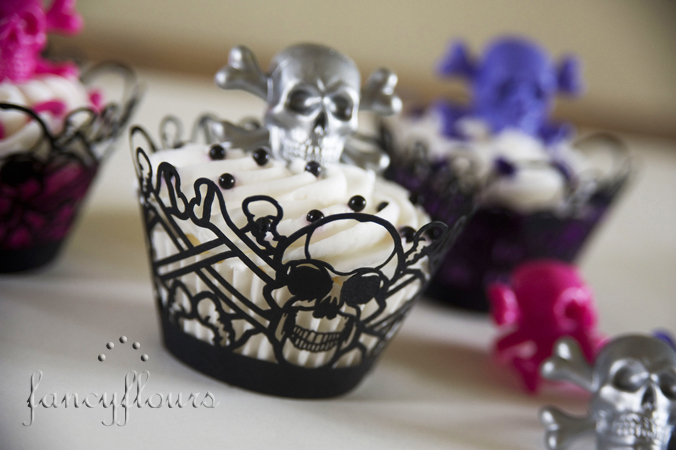 • Affix Skull and Crossbones Picks to cupcakes by gently pushing into the frosting. This entry was posted in Cupcake Recipes & Ideas, Halloween Baking, Instructions & How-To's, Recipes & Tips and tagged cupcake wrappers, picks, skull by Fancy Flours. Bookmark the permalink.